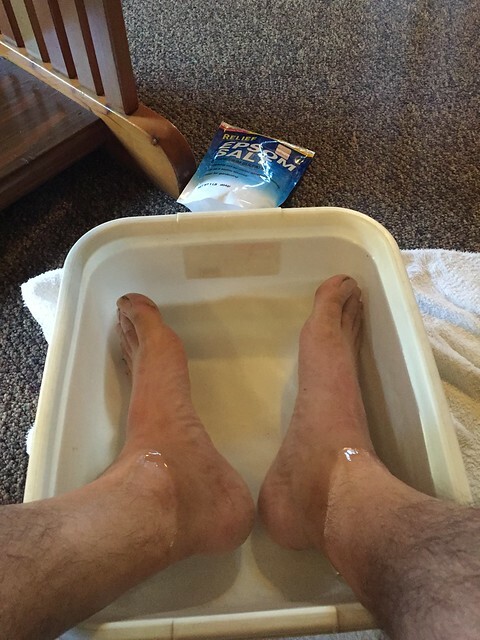 Today was going to be a nice short day--a morning walk to the Paradise Cafe at the intersection of highways 74 and 341, then a ride over to Idyllwild for an afternoon of laundry and a bit of resupplying... and soaking my feet in a nice warm bath. Weather Report: Low 48, High 88. Generally sunny with light wind and around 70. Wildlife seen: Mountain lion footprint. Delphinium. The wind overnight had shifted around completely. When I went to bed, it was coming in gusts out of the west; when I woke up it was coming in steady from the east, and dry. The weather was changing, more Santa Ana winds out of the desert are forecast for the next few days, and I wondered how windy it'd be up on San Jacinto in the next few days. The miles to the cafe were generally more of the same, up and down canyons and contouring around in the style I've grown accustomed to, discreetly avoiding crossing the invisible boundaries between public and private land. 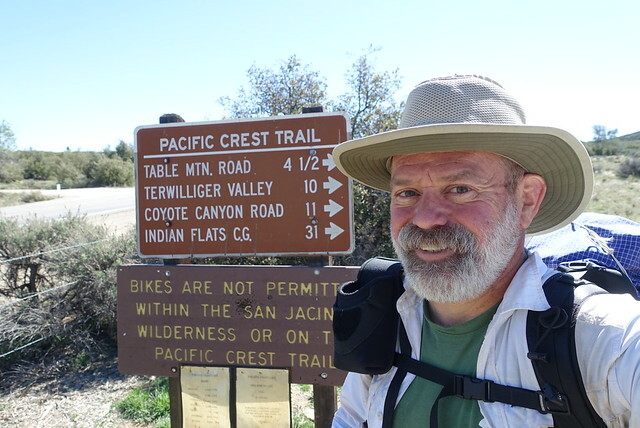 I can see the checkerboarded land ownership on my GPS, and watched the PCT taking two or three miles to cross each square mile block, exiting in the very corners to go the next square. 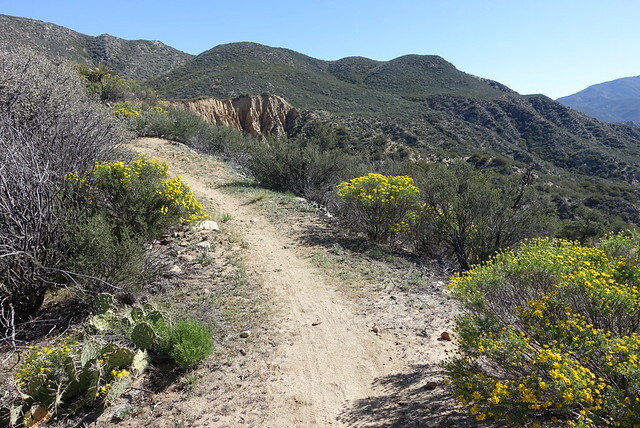 Most of the land I'm crossing is either BLM land or more likely state parkland; I'm still walking through Anza Borrego Desert State Park after six days, but at least I've finally left San Diego County. As I got closer to the trailhead Highway 74 I started seeing six or eight mountain bike tracks, which was annoying, cutting up the side of the trail and such. It's probably from the weekend; those big signs that say "Bikes are not permitted on the PCT" aren't hard to miss but cheaters are going to cheat. Yeah, it would be a great ride, but find your own trails. I've stood aside so many times by mountain bikers on shared use trails (not a problem! ); bikers should show a little respect for hikers for once and just stay off the PCT. There weren't many interesting nature views--a pretty canyon here and there, a few flowers now and then--but there were quite a few views of human activity. Here and there, a hillside was leveled for a building pad, with a trailer and/or a truck there. I wondered what type of person would build a house there, exposed to the drying wind at the top of a brush filled canyon that will no doubt burn in five or ten years. Probably someone with libertarian leanings, who feels self-sufficient and doesn't want to deal with the hecticness of the city and has more than a healthy distrust of government and corporations and big organizations. I'll be seeing those people on the TV news in two or six months begging for CalFire to save save their brand new home, and they'll be calling the firefighters heroes, and they'll get more government disaster relief to rebuild where they shouldn't have built in the first place--yet they'll still write angry letters railing against the moochers and people that take government handouts. I'd been seeing large white growhouses and oddly large outbuildings (probably chemical manufacturing operations) for many miles, and have been feeling more than a bit creeped out. This is a forgotten part of southern California, it's not a place you seek out and it's a good place to retreat and hide. I thought about the Indian reservations I passed along the way, the ones beyond the Outer Rim of the San Diego Indian Casino Belt--what really goes on in these sovreign lands? They're opaque and you never hear anything about them. A few months ago, a hiker on the PCT went missing in this same area, he still hasn't been found. The area has more than a bit of lawless feel to it, vaguely threatening in a Pynchonesque sort of way, but nothing that can be really seen in the daylight. I made it up to highway 74 and crossed the highway, not quite getting hit by two cars racing east, one passing the other across the double-yellow. I really tried not to stereotype the drivers of the cars--one a Lexus, one a BMW--but it was a bit fun to make a little story, something about super-affluent Orange Countians late for their relaxing spa appointments in Palm Desert, or perhaps commuting to close some real estate agent bizness. After taking a picture of the PCT closure sign, I crossed back over to the south side of the highway; it took me several minutes for traffic to clear as yet more expensive cars and Very Large SUVs sped east and west. This road crossing was probably the most dangerous part of the PCT so far. 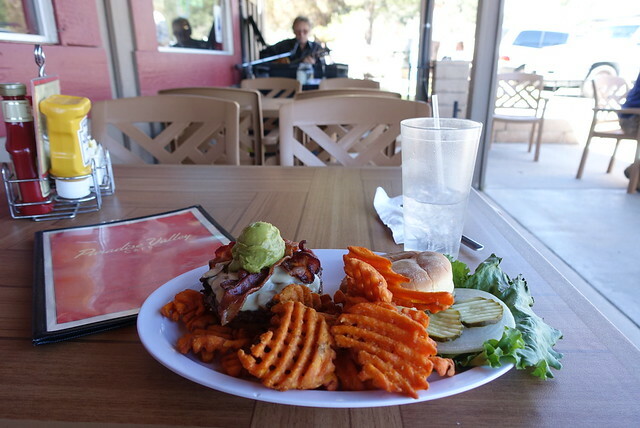 It was a mile further to the Paradise Valley cafe, and the thought of a tasty burger and a drink cheered me up. I decided I needed to be more appreciative for the rest of the day; I've basically given myself the gift of five months of living, and I should be thankful for that, and not quite so ill-tempered. I was feeling a bit weary, and after downing three Sprites I settled in and waited for No Tent. There was a live musician there (on a Wednesday morning, go figure), and we chatted a bit. His name was Phoenix, and he gave me the "Tiny Bubbles" earworm for the rest of the day. 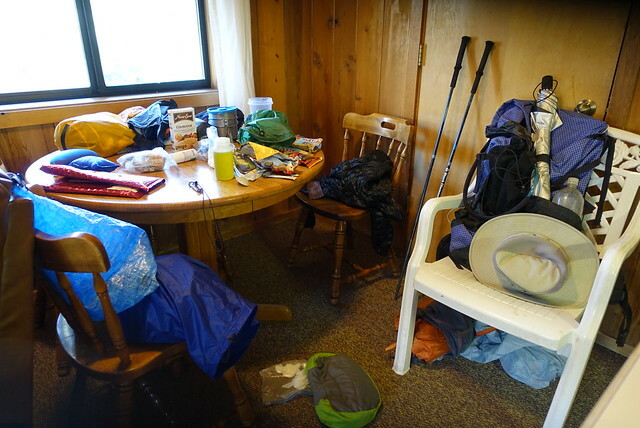 No Tent did show up, along with Mile-an-hour, and we ate and had a good time. We all got a ride over into Idyllwild around 2, and I checked into a cabin at the Idyllwild Inn--highly recommended, in the center of town. I ambled into the Town Baker and said hello to Alphabet Soup and Dynamo, shopped at the grocery store then decided I didn't need anything there, and shopped at the health food store and bought some Perfect bars and Kind bars and nuts and such. I really didn't need any resupplies, I have dinner for tomorrow night already. After some laundry and some footcare, there was pizza to be had at Idyllwild Pizza, and then I really crashed hard around 8:30. All in all, an interesting day, pretty much like each day. Every day is different and new. PCT. Foot bath. Epsom salt. How does it work?